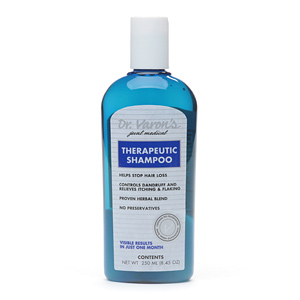 Dr. Varon's Therapeutic Shampoo is in a natural formula with no preservatives. The herbal contents are so concentrated that they will settle to the bottom of the bottle. Shake well to activate this formula before using. This is a therapeutic shampoo, so the use of a hair conditioner is not necessary. Dr. Varon's Shampoo is ideal for thinning hair, or for thick hair as a twice a week supplement to one's current shampoo regimen. It is excellent in providing relief for Seborrhea, Dermatitis, Psoriasis and controlling Dandruff. Your hair will look shinier, healthier, fuller and easier to manage and there will be a lot less of your hair in the shower drain. Espinosilla~ A unique herb grown only in Central Mexico. Espinosilla makes scalp and hair roots healthy and strong by supplying oxygen and essential nutrients. It is known to prevent hair loss and in some clinical tests actually regenerated hair growth. This herb is also used in the treatment of dandruff and seborrhea. Jojoba~ Jojoba extract contains all forms of vitamin E. Best known as a deep cleanser and conditioner of the scalp, it has esters similar to the natural restorative esters produced by human sebaceous glands. Ginseng ~ Ginseng contains vitamins A, B - 6 and mineral Zinc which aids in the production of thymic hormones. It is known to keep hair soft and healthy and to help it regenerate.